In a 1960 film called The Amazing Transparent Man, by the great auteur of poverty row, Edgar G. Ulmer, an ace safe cracker - whose name is Faust - is sprung from jail by the mysterious Major Krenner. Krenner agrees to shield Faust from the police but in exchange he must do Krenner's bidding: submit to atomic experiments that render him invisible, and carry out a series of thefts of radioactive materials that will allow Krenner to create an "invisible army" to invade America from the inside. Knowing full well that the invisibility experiments, though giving Faust temporary power and freedom, will ultimately be cancerous due to the high level of radioactivity involved, Krenner of course never submits to the experiment himself. A recent Twitter post from the account of brand strategist and "media futurist" Gerd Leonhard also evoked the mythical German scholar who made a deal with the devil - with a hash tag no less: #faust. Leonhard was linking to an article about the way ad companies collect data about us through cookies picked up on the sites we visit. "We get free content" wrote Leonhard, "in return we allow data collection." Considering the famously opaque privacy policies routinely published by companies such as Google and Facebook, we might argue that these dotcoms, like Ulmer's Major Krenner, expect a transparency from their users that they would never submit to themselves. There was a certain furore a few weeks ago, spreading like a virus from the blog of Ben Goldacre to the Twitter account of Graham Linehan to the Guardian column of Charlie Brooker. It concerned the automatic "sharing" of your Spotify listening habits. "A service that comes into my home and into my pocket should not automatically broadcast what I'm doing out into the world, unless I ask it to do so," huffed Goldacre. "I pay a tenner a month for a music service not to advertise my tastes," bellowed Linehan. "When sharing becomes automated, " Brooker panted, "I get the heebie-jeebies." We may well be sympathetic to the sentiments expressed by these three righteous indignados, but at the same time it is hard to escape the conclusion that their outbursts belie a fundamental misunderstanding of their role in the whole social media shebang. Each of these comments articulate the complaint of a customer against a service. But if you use Spotify to listen to music, you are not the customer of this service - on the contrary, you are the product. To call Spotify a music service is like calling the devil a music teacher. The devil deals in souls, Spotify deals in data. In this respect, social media is much like most old media: its express purpose is to sell audiences to advertisers. "For the "content" of a medium" wrote Marshall McLuhan, "is like the juicy piece of meat carried by the burglar to distract the watchdog of the mind." The major innovation of the so-called 'social media' of Web 2.0 is that they create an environment in which their products willingly arrange themselves in the virtual shop window in a manner not dissimilar to the scene early in Michael Bay's first Transformers film featuring a car that wants to be sold and will do practically anything to ensure that it is sold. In his 2010 book, You Are Not a Gadget, virtual reality pioneer Jaron Lanier argued that the design of social networking sites encourages us to reduce our personality to a series of multiple choice answers which make them easier for computers to understand. "When developers of digital technologies design a program that requires you to interact with a computer as if it were a person," he said, "they ask you to accept in some corner of your brain that you might also be conceived of as a program." And later, "I fear that we are beginning to design ourselves to suit digital models of us, and I worry about a leaching of empathy and humanity in that process." Lanier thinks that such websites encourage people to act and think like machines - to become, as it were, themselves gadgets. I would claim that they encourage people to act less like gadgets, which after all tend to do useful things, but rather like those machines that do nothing at all other than zoom about with their Mattel logos and their shifting postmodern identities, uttering gnomic sentences - like Transformers, in a word. Like, branded products. Spotify is fairly open about all this. "We can offer you some clever targeting to pinpoint your customers, including demographics, location, and music genre. Smarter than any offline media and up there with the best that digital media has to offer" they promise on their website. "Of course, detailed tracking and reporting comes as standard." Their business plan relies on being able to feed the data of your listening habits into the demographic profiles beloved of advertisers. They promote this service to prospective advertisers. Of course, it makes life a lot easier for them if you promote it for them - or even better, automate it. This very "sharing", whether you like it or not, is the very appeal of the service to advertisers, it allows them to create a "social graph" which they can then use to pinpoint their ads very precisely at particular peer groups at particular times. 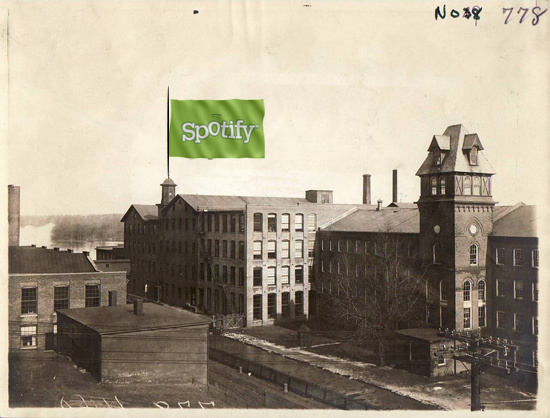 Indeed, now that Spotify is fully Facebook integrated, you make the social graph for them. You display it with pride for all to see and tend it like a rose garden. Many will no doubt argue that Spotify actually makes a fairly small amount of its money from advertising. In 2010 it took about £28 million in advertising - roughly a third of its income. But then the fact is that, right now, in the grand scheme of things, Spotify doesn't make very much money out of anything. They still lost over $40 million in 2010. But Spotify awaits with baited breath what Jaron Lanier calls "the messianic advertiser" - the advertiser to come, the advertiser who must be appeased above all else precisely because s/he has not yet arrived at the table. In many respects the messianic advertiser is a phantom, a Ponzi scheme. Deep down the social networks know that they will never make that much advertising revenue, but they must present themselves otherwise in order to attract venture capital and protect their chances of a healthy stock market flotation down the line. All such online businesses which seem to be promising something for nothing - from social networking to file sharing - are really offering you, their audience, as a readymade and fully packaged item for purchase, be that by the ghost of advertising's future, or the investor whose faith gives that ghost substance. You may well ask what is the problem with all this - they've got to make money somehow, right? After all, if most of the data being gathered about you is simply gathering virtual dust, waiting for some hypothetical man or woman of the future who knows how best to exploit it - who cares? But as we increasingly learn to live our lives online, as more and more of the 'real' world moves into virtual space, the spectre of social networking data being accessible by credit rating agencies, insurance companies, and potential employers, should start to make the whole deal look decidedly Faustian. The airing of our dirty listening laundry in public may not be so serious - merely creepy, as Brooker suggests. What is more disquieting is the way this data can be made to fit into a whole spider web of information woven by cookies gathered at almost every website you poke your nose into. Now that we have become inured to the practice of feeding our data into the machine in easily digestible, bite-sized chunks; now that we are weaned on free music, free communication, free culture; Spotify, Facebook, YouTube and all may one day look like the cyclist in the famous joke about the cyclist at the border crossing between East and West Berlin. Every time he crosses the border from West to East, the guard searches him thoroughly, convinced he must be smuggling something, but never finds a thing on him. Only years later, after the wall has come down, does the guard finally discover - all along the man was smuggling bicycles.